Stephen Kotkin, professor of history and international affairs at Princeton and a fellow at the Hoover Institution, previously detailed Stalin’s early life and rise to power in his highly acclaimed Stalin: Paradoxes of Power, 1878–1928, the first volume of his epic biography of the Soviet ruler. Kotkin’s just-released second volume, Stalin: Waiting for Hitler, 1929–1941, meticulously explores Stalin’s roles in forcibly collectivizing Soviet agriculture, the systematic murder and imprisonment of communist party officials, military leaders, and intelligence agents known as the Great Terror, and the diplomatic events leading up to the Second World War. Kotkin describes him as a “Communist and a revolutionary,” bookish with a phenomenal memory but “coarse manners.” He had a remarkable will to power. He was also a sociopath. “’Murderous’ and ‘mendacious,’” the author writes, “do not begin to explain” Stalin. He had tens of thousands, including many of his close colleagues, tortured by the secret police (the NKVD) until they confessed to “crimes” they never committed. His collectivization policies produced a massive famine in the early 1930s, especially in Ukraine and the Kazakh autonomous republic, resulting in widespread cannibalism in some areas and the death of more than five million people. Under Stalin’s rule, the slave-labor camp system known by the acronym GULAG metastasized (to use Solzhenitsyn’s apt analogy), imprisoning and punishing millions for ordinary crimes and political crimes. “World history,” Kotkin notes, “had never before seen such carnage by a regime against itself, as well as its own people—not in the French Revolution, not under Italian Fascism or Nazism.” Stalin waged sustained, brutal war against his own people. Leninism created the dictatorship of the proletariat to seize power, foment revolution, and bring about an end to “exploitive” capitalism. Stalinism perfected that dictatorship by inserting the state/party apparatus into all aspects of Soviet life, including literature and the arts. Kotkin provides vivid portraits of Stalin’s Communist Party henchmen, including Molotov, Beria, Kaganovich, Bukharin, Kirov, Zhadanov, Yagoda, Yezhov, and Khrushchev, who out of ideology and fear implemented the dictator’s policies. While Stalin was subjecting his country to mass starvation and public show trials of “enemies,” “Trotskyists,” and “traitors,” the latter of which included most of the country’s top military leaders, the world was lurching toward war. Stalin’s collectivization program and the Great Terror coincided with the rise to power in Germany of Adolf Hitler, a gangster-statesman who was determined to overturn the Versailles diktat of the Great War and impose his will on the world. Kotkin recounts the familiar tale of Western appeasement of Germany during the 1930s, and the diplomatic maneuvering of the world’s great powers in the run up to World War II. The Western democracies, fearing a replay of the carnage of the First World War, flirted with a Soviet alliance to contain Germany, but understandably doubted the effectiveness of the Soviet military in the wake of the Great Terror. They also, understandably, feared communism. Stalin for his part distrusted the capitalist enemies, especially the British. He stunned the world in August 1939 with the Nazi-Soviet non-aggression pact, which contained a secret clause dividing up Poland and Eastern Europe between the two dictators. Stalin also sought to avoid a two-front war against Germany in Europe and Japan in the Far East. The Soviet Union partitioned Poland with Germany in September 1939. The next year, Soviet armies annexed the Baltic states and invaded Finland. Stalin was Hitler’s willing accomplice in starting the European phase of the Second World War. The author concludes his second volume of Stalin with Germany’s military build-up on the Soviet border, the repeated but often vague and contradictory warnings the Soviet dictator received from foreign statesmen and his own spies about Germany’s intentions towards the Soviet Union, and the German invasion of Soviet territory on June 22, 1941. 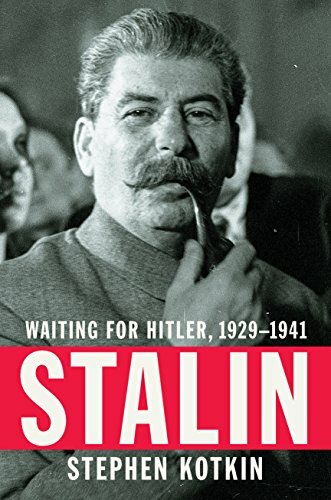 Kotkin’s exhaustive research, careful historical judgments, shrewd insights, and splendid writing leave little doubt that when it is completed, his biography of Stalin will set the standard for all future biographers.